Just need the default password? Try username st2admin, password Ch@ngeMe. Need to change the password? Run: sudo htpasswd /etc/st2/htpasswd st2admin. Something more complex? Read on to learn about StackStorm authentication. StackStorm includes an auth service that is responsible for handling user authentication and generating time-limited access tokens. When authentication is enabled (the default), those access tokens are used to authenticate against the StackStorm REST APIs. By default, the StackStorm configuration file is located at /etc/st2/st2.conf. The settings listed below are configured under the auth section in the configuration file. The service can be configured with different backends (i.e. PAM, LDAP, etc.) to handle authentication. If a backend is not specified, an htpasswd-compatible flat file authentication backend is used. We recommend that the service be configured to listen on https (use_ssl option) and be accessible to st2 clients. host Hostname for the service to listen on. port Port for the service to listen on. use_ssl Set to True to enable SSL/TLS mode. cert Path to the SSL certificate file. Only used when use_ssl is set to True. key Path to the SSL private key file. Only used when use_ssl is set to True. mode Mode to use (proxy or standalone). Default is standalone. backend Authentication backend to use in standalone mode (i.e. pam, flat_file). Please review the supported list of authentication backends below. backend_kwargs JSON-serialized arguments which are passed to the authentication backend in standalone mode. token_ttl The token lifetime, in seconds. By default, the token expires in 24 hours. enable Authentication is not enabled for the StackStorm API until this is set to True. If running StackStorm on multiple servers, please ensure that this is set to True on all StackStorm systems. Standalone mode is the default auth mode where external users authenticate directly with StackStorm. Under the hood the st2auth service delegates to the configured backend to perform the authentication. When the backend service properly authenticates the user, an auth token is returned. This token can then be used to make further API calls. REMOTE_ADDR - Source of the request (hostname/ip of the user who authenticated against the proxy). REMOTE_USER - User identity (username) of proxy authenticated user. The request will return an auth token that authenticated user can use to make further API calls. When using a reverse proxy such as Apache in front of st2auth, those two CGI environment variables are usually set automatically by a proxy upon successful authentication. The service can be configured with different backends (i.e. PAM, LDAP, etc.) to handle the authentication. If a backend is not specified, an htpasswd-compatible flat file authentication backend is used. To use a different backend, select and install the appropriate python package from the StackStorm community repos and configure st2auth accordingly. 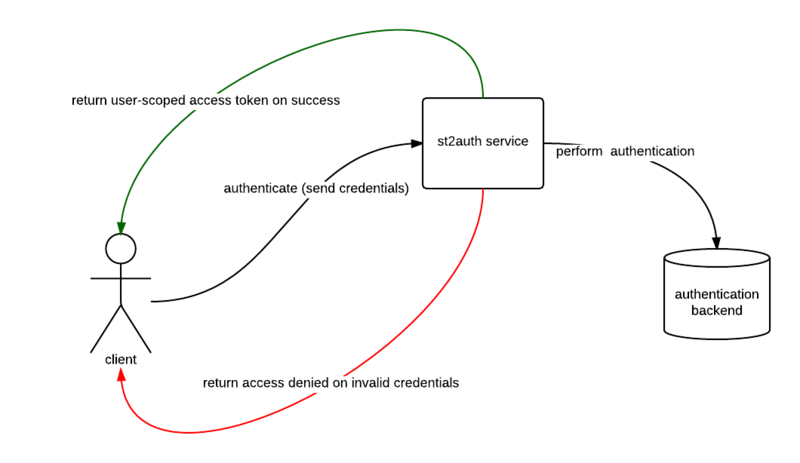 When using the pam authentication backend you need to make sure that the st2auth process runs as root otherwise authentication will fail. For security reasons st2auth process runs under st2 user by default. If you want to use pam auth backend and change it to run as root, you can do that by editing the service manager file for the st2 auth service. StackStorm uses a Python virtual environment in /opt/stackstorm/st2/ for StackStorm dependencies and components. This means that if you want to work with the StackStorm installation (e.g. use the python binary from that virtualenv or to install a new auth backend), you need to use the StackStorm virtual environment. StackStorm-developed auth backends such as LDAP are only available in Extreme Workflow Composer. For more information on Extreme Workflow Composer, please visit https://stackstorm.com/features/#ewc The auth backends included with Extreme Workflow Composer are developed, tested, maintained, and supported by Extreme Networks. group_dns_check no and What kind of check to perform when validating user group membership (and / or). When and behavior is used, user needs to be part of all the specified groups and when or behavior is used, user needs to be part of at least one or more of the specified groups. By default a logical and check is performed when validating user group membership against groups defined in group_dns config option. This means if multiple groups are specified, the user needs to be member of all the specified groups for authentication to succeed. If you want to use or behavior instead (user needs to be a member of one or more of the specified groups), you can achieve that by setting the group_dns_check config option to or. This will need customization for your environment - e.g. the LDAP server to bind to, and the cert and key paths if you are using SSL. st2auth is set up to run as a service. It runs under gunicorn. # If use_ssl is set to True, the following will fail because SSL is required. # The following will fail with 401 unauthorized. Please note that this is executed with "-k" to skip SSL cert verification. # The following will succeed and return a valid token. Please note that this is executed with "-k" to skip SSL cert verification. # The following will verify the SSL cert, succeed, and return a valid token. Once authentication is enabled, API calls require a token to be passed via the headers. CLI calls require the token to be included as a CLI argument or as an environment variable. Using st2 login will simplify logging in, getting a token, and automatically adding it to the environment. If your password contains special characters such as $, they may be interpreted by the shell. Wrap your password in single quotes (') as above. # Include the token as command line argument. # Or set the token as an environment variable. Note that if the TTL requested is greater than the configured maximum allowed TTL, you will get an error. If you don’t want to retrieve a new token and configure the environment variable every time you start a new shell session, you can put your StackStorm credentials in the CLI configuration file. Then the CLI will automatically authenticate, retrieve and cache the auth token for you. For information on how to do that, see the CLI configuration page. StackStorm also supports API keys. These differ from tokens in that they do not expire. This makes them suited for integrations with other applications, e.g. through webhooks. All API key management is currently available via the StackStorm CLI or API. For security purposes the <API_KEY_VALUE> is only shown at create time. StackStorm itself does not store this API Key value in its database, only a one-way hash is stored. It is not possible to retrieve an API Key after creation. If the API Key is lost or not recorded at the time of creation, delete the API Key and create a new one. The optional -m attribute allows metadata to be associated with the created key. It is good practice to assign a meaningful value like the external service which uses this key to authenticate with StackStorm. The CLI for API keys also support get, list, delete, enable and disable commands. If an API Key is disabled it will disallow access until that API key is enabled again. This is a good way to temporarily revoke access of an external service to StackStorm. API keys are designed for API access. As of now they cannot be used via clients like the UI and CLI. On the old StackStorm instance run the following command to save API keys into a file. Note that secrets are masked, based on configuration setting. If masking is enabled an admin can on a per-API call basis disable the masking without having to make config changes. See Configure secrets masking to see how to disable masking on a system wide basis. To authenticate against the StackStorm API, either an authentication token or an API key (but not both) should be provided in the HTTP request headers. The headers are named X-Auth-Token and St2-Api-Key respectively. If for some reason you can’t specify an auth token or API key in the headers (e.g. you are using a third party service to integrate with StackStorm and this service doesn’t allow you to specify custom headers), you can provide it as a query parameter named x-auth-token and st2-api-key respectively. Keep in mind that using HTTP header is preferred since some web servers and third party services log query parameters which are sent with each request. This could lead to auth token / api key exposure and potentially pose a security risk. $ curl "https://myhost.example.com/api/v1/actions?x-auth-token=<auth token value>"
$ curl "https://myhost.example.com/api/v1/actions?st2-api-key=<api key value>"